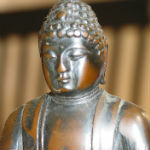 This discovery was the basis for his quest to achieve enlightenment and eventually to the creation of Buddhism. 1. An idea that is developed and put into action is more important than an idea that exists only as an idea. 3. 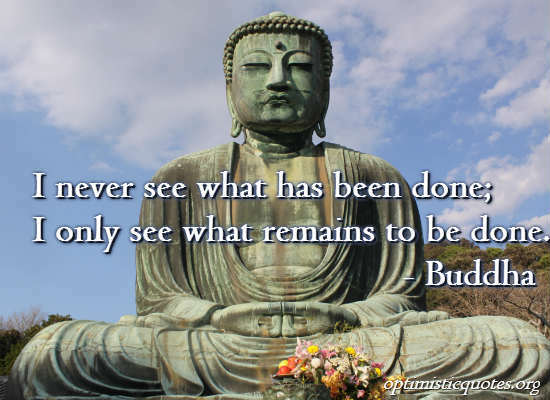 I never see what has been done; I only see what remains to be done. 4. Even death is not to be feared by one who has lived wisely. 5. Hatred does not cease through hatred at any time. Hatred ceases through love. This is an unalterable law. 6. Do not dwell in the past, do not dream of the future, concentrate the mind on the present moment. 7. Hatred does not cease by hatred, but only by love; this is the eternal rule. 8. Health is the greatest gift, contentment the greatest wealth, faithfulness the best relationship. 9. All wrong-doing arises because of mind. If mind is transformed can wrong-doing remain? 10. Do not overrate what you have received, nor envy others. He who envies others does not obtain peace of mind. 11. It is better to conquer yourself than to win a thousand battles. Then the victory is yours. It cannot be taken from you, not by angels or by demons, heaven or hell. 12. An insincere and evil friend is more to be feared than a wild beast; a wild beast may wound your body, but an evil friend will wound your mind. 13. Doubt separates people. It is a poison that disintegrates friendships and breaks up pleasant relations. 14. Let them not do the slightest thing that the wise would later reprove. 16. There are only two mistakes one can make along the road to truth; not going all the way, and not starting. 18. However many holy words you read, however many you speak, what good will they do you If you do not act on upon them? 19. If we could see the miracle of a single flower clearly, our whole life would change. 20. In the sky, there is no distinction of east and west; people create distinctions out of their own minds and then believe them to be true. 21. Peace comes from within. Do not seek it without. 22. The only real failure in life is not to be true to the best one knows. 23. Thousands of candles can be lit from a single candle, and the life of the candle will not be shortened. Happiness never decreases by being shared. 24. A man is not called wise because he talks and talks again; but if he is peaceful, loving and fearless then he is in truth called wise. 25. As the fletcher whittles and makes straight his arrows, so the master directs his straying thoughts. 26. Believe nothing merely because you have been told it. Do not believe what your teacher tells you merely out of respect for the teacher. But whatsoever, after due examination and analysis, you find to be kind, conducive to the good, the benefit, the welfare of all beings — that doctrine believe and cling to, and take it as your guide. 27. Better than a thousand hollow words, is one word that brings peace. 28. He who experiences the unity of life sees his own Self in all beings, and all beings in his own Self, and looks on everything with an impartial eye. 29. All things appear and disappear because of the concurrence of causes and conditions. Nothing ever exists entirely alone; everything is in relation to everything else. 30. Meditate. Live purely. Be quiet. Do your work with mastery. Like the moon, come out from behind the clouds! Shine.